Home Unlabelled This baby slept with a snake every single night. But 11 years later, look what it became! Sambath is an 11-year-old boy from Cambodia and, like many children, he has a pet. 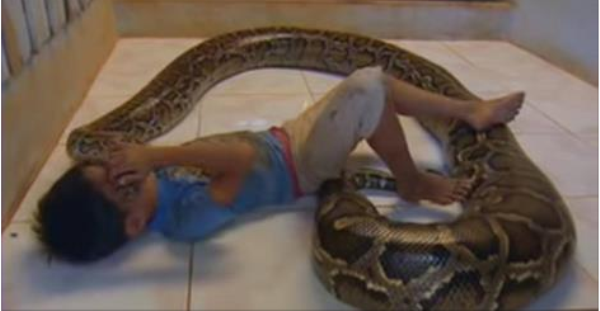 But his pet is not what you would call “ordinary.” It’s an 18-foot-long, 250-pound python! When Sambath was just three months old his parents found the snake under his crib. The python was also just a baby at the time and measured less than a foot long. But no matter how many times Sambath’s parents took the little intruder out to the garden, it always managed to find its way back into the house. Finally they gave up and decided to keep the animal as a pet. They named it “Chomran” and for the past 11 years it’s been their son’s loyal companion.